A recent study published by the Journal of Neural Regeneration Research found acupuncture treatments can lead to improved cognitive function. Functional brain MRIs showed an increase in the communication areas of the brain associated with higher level cognitive function and memory. When cognitive function is improved, so too is one’s ability to stay focused and on task. This study also concluded acupuncture treatments can increase neural plasticity, which decreases naturally as we age. All of this demonstrates acupuncture can indeed improve overall brain function, allowing people to live more fulfilling lives. Staying focused can be challenging in the world we live in. We are constantly bombarded with sights, sounds, smells, interruptions and more. It can be really frustrating. A recent study by Microsoft found the average human has an attention span of only eight seconds! By comparison, a goldfish has a nine second attention span. We, as a species, can’t even remain focused as long as a goldfish. This speaks volumes about the state of the world. Part of the problem is our bodies were designed to move and we have become too sedentary. Our nervous system doesn’t know how to respond to this. And it also affects our muscles, tendons and circulatory systems. The more time we spend on our phones, tablets, etc., the more stagnant everything becomes. Our muscles shorten, tighten and atrophy, our circulation becomes sluggish and our brains foggy. For everything to function properly, you have to get up and move. But there are other ways to increase focus and concentration. Traditional Chinese Medicine (TCM) can be very helpful when it comes to improving focus and concentration. There are specific acupuncture points, as well as individual herbs and herbal formulas that can be utilized. One of the most commonly used acupuncture points for improving focus is called Du 20 or Governing Vessel 20. This point is located on the top of the head, midway between the apexes of both ears. Du 20 has been noted to improve mental clarity and awareness, while also enhancing memory. Yin Tang is another favorite point of licensed acupuncturists. Yin Tang is located between the inner ends of both eyebrows. Yin Tang improves concentration and memory, while also clearing the mind and lifting the spirits. There are a couple of individual herbs used in TCM that can be very helpful for improving focus. The first is known as Dan Shen or Salvia. TCM uses this herb to increase blood flow and a study done in 2003 showed focus and memory were improved on subjects who used this herb. An herbal formula known as Bu Nao Wan is frequently prescribed for people who have memory problems related to weakness in the kidney system of TCM. Several of the herbs in this formula have been used for centuries to calm the mind and improve focus. 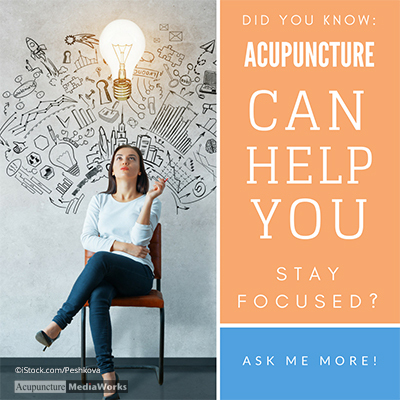 If you or somebody you know suffers from attention deficit issues, acupuncture might be exactly what they need to get back on track. Ask me to find out how acupuncture can help!